Businessman and investor. Born Warren Edward Buffett on August 30, 1930, in Omaha, Nebraska. Buffett’s father, Howard, worked as stockbroker and served as a U.S. congressman. His mother, Leila Stahl Buffett, was a homemaker. Buffett was the second of three children and the only boy. Buffett demonstrated a knack for financial and business matters early in his childhood. Friends and acquaintances have said the young boy was a mathematical prodigy who could add large columns of numbers in his head, a talent he occasionally demonstrated in his later years. Warren often visited his father’s stockbrokerage shop as a child, and chalked in the stock prices on the blackboard in the office. At 11 years old he made his first investment, buying three shares of Cities Service Preferred at $38 per share. The stock quickly dropped to only $27, but Buffett held on tenaciously until they reached $40. He sold his shares at a small profit, but regretted the decision when Cities Service shot up to nearly $200 a share. He later cited this experience as an early lesson in patience in investing. By the age of 13, Buffett was running his own businesses as a paperboy and selling his own horseracing tip sheet. That same year, he filed his first tax return, claiming his bike as a $35 tax deduction. In 1942, Buffett’s father was elected to the U.S. House of Representatives, and his family moved to Fredricksburg, Virginia, to be closer to the congressman’s new post. Buffett attended Woodrow Wilson High School in Washington, D.C., where he continued plotting new ways to make money. During his high school tenure, he and a friend purchased a used pinball machine for $25. They installed it in a barbershop, and within a few months the profits enabled them to buy other machines. Buffett owned machines in three different locations before he sold the business for $1,200. 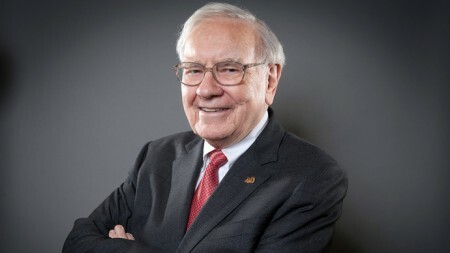 Buffett enrolled at the University of Pennsylvania at the age of 16 to study business. He stayed two years, moved to the University of Nebraska to finish up his degree, and emerged from college at age 20 with nearly $10,000 from his childhood businesses. Influenced by Benjamin Graham’s 1949 book, The Intelligent Investor, Buffett enrolled at Columbia Business School to study under the acclaimed economist and investor. After earning his master’s degree in 1951, he sold securities for Buffett-Falk & Company for three years, then worked for his mentor for two years as an analyst at Graham-Newman Corp. In 1956, Buffet formed the firm Buffett Partnership Ltd. in his hometown of Omaha. Utilizing the techniques learned from Graham, he was successful in identifying undervauled companies and became a millionaire. One such enterprise Buffett valued was a textile company named Berkshire Hathaway. He began accumulating stock in the early 1960s, and by 1965 he had assumed control of the company. Following Berkshire Hathaway’s significant investment in Coca-Cola, Buffett became director of the company from 1989 until 2006. He has also served as director of Citigroup Global Markets Holdings, Graham Holdings Company and The Gillette Company.